The item Justice League, Volume 3, issue 14-19, Timeless, Bryan Hitch, writer ; Fernando Pasarin, Bryan Hitch, pencillers ; Matt Ryan, Daniel Henriques, inkers ; Brad Anderson, Alex Sinclair, colorists ; Richard Starkings and Comicraft, letterers ; Fernando Pasarin, Matt Ryan and Brad Anderson, collection cover artists, (electronic resource) represents a specific, individual, material embodiment of a distinct intellectual or artistic creation found in Kent District Library. 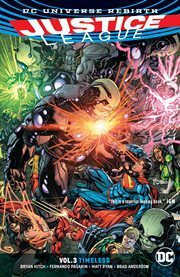 The Rebirth of the Justice League continues in a thrilling, action-packed story that could only come from comics superstar team Bryan Hitch (THE AUTHORITY, The Ultimates) and artists Fernando Pasarin (GREEN LANTERN CORPS) and Matt Ryan (WONDER WOMAN). An army of aliens known as the Timeless has attacked Earth, sending a wave of destruction through history. Only Earth's first line of defense, the Justice League, is powerful enough to stop them. But the League has been split up, scattered through time to key moments of power...and if the Timeless succeed in destroying these moments, superheroes will never have existed. From Wonder Woman at the birth of the Olympian gods to Cyborg in the distant 31st Centurycentury, each Justice League member is fighting alone against overwhelming odds. All except Batman and Superman, who have traveled together to the ends of the time wave to confront its source. With the very existence of Superman's wife and son at risk, can the world's greatest heroes save Earth's entire history? Or will the Justice League finally run out of time?